One of the most startling leaks — and stunning revelations — of this whole administration has left President Trump and his senior staff furious and rattled. The Washington Post reports in its lead story: "Trump did not follow specific warnings from his national security advisers [yesterday] when he congratulated ... Putin on his reelection — including a section in his briefing materials in all-capital letters stating 'DO NOT CONGRATULATE.'" Why it matters: The speed and sensitivity of the leak prompted immediate finger-pointing within the administration, as aides reeled from a leak that could only have come from a small group of people, each of whom is trusted with sensitive national secrets. Possible motives include concern about how Trump is handling Putin, frustration by the officials about Trump ignoring their advice, or internal power games. A White House official, furious about the WaPo story: “This is the way Trump is. If he’s doing business with you or working with you in some way, he’s going to congratulate you." The official said: "The idea he’s being soft on Russia is crap. He approved Javelin missiles to Ukraine, closed the consulate in San Francisco, approved the sanctions. ... But ... he doesn’t want his personal relationship [with Putin] to be acrimonious." 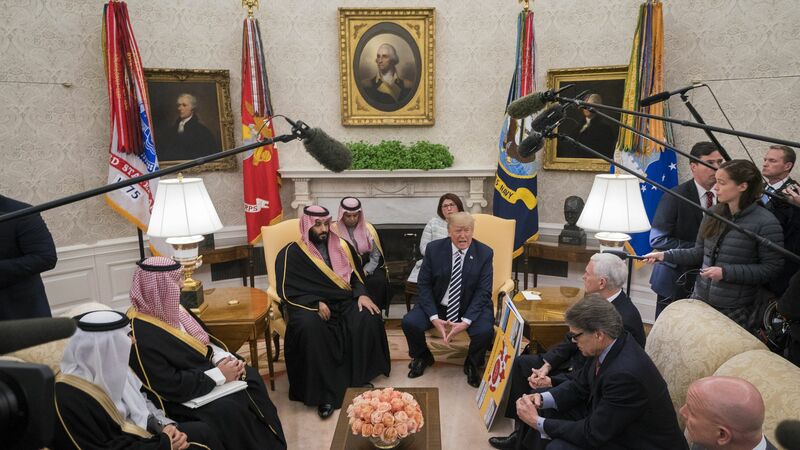 Trump had nonchalantly disclosed his message to Putin, while speaking to reporters during an Oval Office appearance with Saudi Crown Prince Mohammed bin Salman. Trump told reporters: "I had a call with President Putin and congratulated him on ... his electoral victory." "We had a very good call, and I suspect that we’ll probably be meeting in the not-too-distant future to discuss the arms race, which is getting out of control — but we will never allow anybody to have anything even close to what we have. And also to discuss Ukraine and Syria and North Korea and various other things." "So I think, probably, we’ll be seeing President Putin in the not-too-distant future." Why it matters, from the WashPost: "The president’s conversation with Putin ... prompted fresh criticism of his muted tone toward one of the United States’ biggest geopolitical rivals amid the special counsel investigation."